A volcanic sand grain with many vesicles, viewed with a petrographic microscope. Scale box in millimeters. 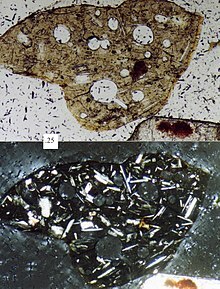 A related texture is amygdaloidal in which the volcanic rock, usually basalt or andesite, has cavities, or vesicles, that are filled with secondary minerals, such as zeolites, calcite, quartz, or chalcedony. Individual cavity fillings are termed amygdules (American usage) or amygdales (British usage). Sometimes these can be sources of semi-precious stones such as diamonds. Rock types that display a vesicular texture include pumice and scoria. ^ D. Armstrong, F. Mugglestone, R. Richards and F. Stratton "OCR AS and A2 Geology". Pearson Education Limited, 2008, p. 76.